Incomprehensible: President Obama compares the human rights violations of Malaysia to the U.S.
Tonight @ 8pm ET: In tonight's explosive season finale, For the Record investigates the events that led to the September 2012 attack in Benghazi, Libya that killed ambassador Chris Stevens and three other Americans. Find out why the U.S. government armed terrorists connected to Al-Qaeda and the Muslim Brotherhood instead of acting on a proposed ceasefire. Everything you thought you knew about Benghazi will be unraveled. Tonight @ 8:30pm ET: Is a single payer healthcare system on the horizon for the United States? Tonight on Real News Investigates, Buck Sexton takes a deeper look into the realities of government funded health insurance and whether Obamacare is nothing more than a Trojan horse for the progressive-championed single payer system. Gohmert: Benghazi talking points "an intentional misleading of the American public"
Sponsored: Ex-CIA Operative and Shark Tank Star reveals… HOW SPIES THINK! Discover the dirty secrets, mind control games, and self-defense tactics of a real life James Bond! Click here. In tonight's explosive season finale, For The Record investigates the events leading up to the September 11, 2012 terrorist attacks in Benghazi, Libya. TheBlaze's senior Washington correspondent Sara Carter has written a series of investigative reports to accompany the groundbreaking episode. Read the third installment HERE. NEWSLETTER EXCLUSIVE: Read a free chapter and get 50% off Glenn's new book Conform! Glenn's latest book Conform: Exposing the Truth About Common Core and Public Education will be released next Tuesday, but, this week only, we are running a newsletter exclusive promotion. Glenn Beck Newsletter subscribers can get a sneak peek of the book HERE. Plus, pre-order your copy of Conform from the Glenn Beck Store and receive 50% off the retail price with promo code BLZTHXUBOOK. Order your book HERE. After months of false leads and dead ends, there have been some promising updates in the case of Connecticut teen Justina Pelletier. The Massachusetts Department of Children and Families took custody of Justina after her parents disputed the diagnosis doctors at Boston Children's Hospital handed down. Boston Children's Hospital said the then 15-year-old had a psychiatric disorder – not mitochondrial disease, which her parents had been treating her for at the direction of another doctor. Learn more about the latest developments HERE. While the media's attention is focused squarely on Los Angeles Clippers owner Donald Sterling, there is another story featuring an NBA legend that is as sad as it is offensive. Former Los Angeles Lakers center Shaquille O'Neal posted a picture on Instagram — mockingly captioned "smile today" — showing his face alongside Michigan man Jahmel Binion. The only problem? Binion's missing teeth and abnormal hair growth O'Neal is seemingly poking fun at are a result of a rare disorder called ectodermal dysplasia. See the Instagram post and Glenn's reaction HERE. Ahead of tonight's explosive season finale of TheBlaze's investigative news magazine For The Record, new annual subscribers to TheBlaze TV will receive a 14-day free trial AND a free TheBlaze T-Shirt ($30 retail value). Learn more about the offer HERE. Yesterday, Stu took a deeper look at the Tuskegee Experiment to prove how the government is all too capable of doing horrible things in the name of the 'common good.' Unfortunately, that wasn't the only time the US government experimented on its citizens. Read here for more examples… if you dare… HERE. 5pm ET - The Glenn Beck Program: Glenn continues his conversation with Greg Hartle. Plus, Dana Loesch talks to Gene Hall of the Texas Farm Bureau to discuss the federal Bureau of Land Management's latest land grab in the state. 6pm ET - Real News: A botched execution in Oklahoma Tuesday night has renewed the conversation about the future of the death penalty. The panel discusses the implications. 7pm ET - Wilkow! : If you listen to progressives, they'll tell you the TEA Party is a bunch of old, racist, billionaire white guys who only care about furthering their own self interests. We all know that's not the case. Andrew explains. 8pm ET: For The Record: The September 2012 attacks on the U.S. consulate in Benghazi is the result of a failed foreign policy that enabled the supply of weapons to Libyan rebel forces with ties to terrorism. 8:30pm ET: Real News Investigates: Is Obamacare moving the United States towards a single payer healthcare system? Buck Sexton investigates the implications of healthcare reform. Glenn's latest book Conform: Exposing the Truth About Common Core and Public Education will be released next Tuesday, but, this week only, we are running a newsletter exclusive promotion. Glenn Beck Newsletter subscribers can get a sneak peek of the book HERE . Plus, pre-order your copy of Conform from the Glenn Beck Store and receive 50% off the retail price with promo code BLZTHXUBOOK. Order your book HERE. What happened when Cass Sunstein was asked if a fetus should have the same rights as a horse? Wednesday @ 8pm ET: In this week's explosive season finale, For the Record investigates the events that led to the September 2012 attack in Benghazi, Libya that killed ambassador Chris Stevens and three other Americans. Find out why the U.S. government armed terrorists connected to Al-Qaeda and the Muslim Brotherhood instead of acting on a proposed ceasefire. Everything you thought you knew about Benghazi will be unraveled. Wednesday @ 8:30pm ET: Is a single payer healthcare system on the horizon for the United States? This week on Real News Investigates, Buck Sexton takes a deeper look into the realities of government funded health insurance and whether Obamacare is nothing more than a Trojan horse for the progressive-championed single payer system. What does it mean to be free in today's society? Glenn is on the road this week, broadcasting from the progressive mecca of Los Angeles, California, but he took a moment to pen a blog about the importance of individual responsibility and freedom. "I guess we need each other when life kicks us down," Glenn writes. "But for the first time in human history, there are NO gatekeepers." Check out the rest of the post HERE. Amidst reports that the federal Bureau of Land Management is looking to claim 90,000 acres of land in northern Texas, Texas Governor Rick Perry has publicly warned the BLM to stay away from his state. During an appearance on Fox News last week, Gov. Perry condemned the "out of control" federal government that "already owns too much land." On last night's Glenn Beck Program, Stu filled in for Glenn and welcomed Texas attorney general and Republican gubernatorial candidate Greg Abbott to discuss the land grab. Watch the interview HERE. Ahead of Wednesday's explosive season finale of TheBlaze's investigative news magazine For The Record, new annual subscribers to TheBlaze TV will receive a 14-day free trial AND a free TheBlaze T-Shirt ($30 retail value). Learn more about the offer HERE. In this week's explosive season finale, For The Record investigates the events leading up to the September 11, 2012 terrorist attacks in Benghazi, Libya. TheBlaze's senior Washington correspondent Sara Carter has written a series of investigative reports to accompany the groundbreaking episode. Read the second installment HERE. Are you a side sleeper? Or do you prefer sleeping on your back? Shop The Marketplace by TheBlaze for an ergonomically designed pillow that's right for you—hand made in America with the softest premium duck feather and down for the ultimate sleeping experience. If past comments are any indication, "America's undisputed king of comedy" Louis C.K. is certainly not a champion of conservative causes. But the comedian caused quite a stir on Twitter Monday when he seemingly came out against Common Core testing. Check out the tweets and Glenn's response HERE. 5pm ET - The Glenn Beck Program: Glenn is in Los Angeles this week, and he talks to Greg Hartle of Academy on the Go about his journey from having just $10 in his pocket to success. 6pm ET - Real News: The Supreme Court took up the question of whether or not a police officer may search someone's mobile device without a warrant. How is the court likely to come down? What are the consequences of a decision either way? 7pm ET - Wilkow! : The NBA has officially handed down its punishment of Los Angeles Clippers owner Donald Sterling. Andrew breaks down the league's decision and the precedent it sets. ADA’s 67th Annual Awards Banquet and Membership Convention are around the corner! Join us for our Annual Awards Banquet on Wednesday, June 4th. Then stick around for our activist trainings and ADA’s Membership Convention. Delegates will learn how to effectively lobby your Representatives at home and participate in one of four policy action Commission groups. Commission members will work to craft ADA’s priorities on key progressive issues. There are many ways to RSVP for these exciting events! Purchase your ticket to ADA’s 67th Annual Awards Banquet here. RSVP for ADA’s free June 5th activist training and lobby day here. Purchase your tickets to ADA’s Membership Convention here. You can purchase a full convention pass that includes your banquet ticket. Don’t Miss Out on Discounted Hotel Rates! Coming from out of town? All events will be at the Washington Court Hotel. Take advantage of our discounted room rate of $199 per night. Call the Washington Court Hotel reservation line at 1-800-321-3010 and ask for your reservation with the Americans for Democratic Action block. But don’t wait; the discounted block rate ends May 6th! Endorsements are a specialty of the Southern California chapter of ADA. SoCal ADA will need its long-standing expertise to sort through 18 candidates seeking to replace retiring liberal icon Henry Waxman in a west Los Angeles U.S. House seat. Show business is, not surprisingly, well represented among the resumes of hopefuls running in a district that encompasses Beverly Hills and Malibu. 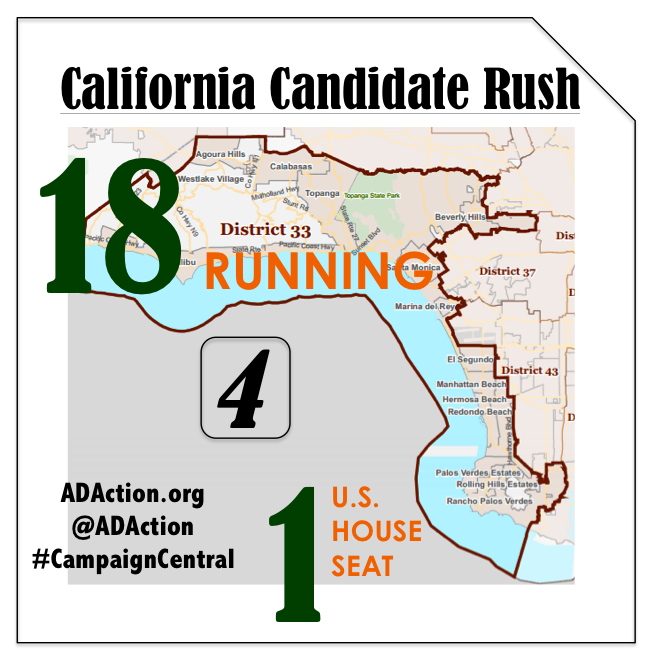 Find out tomorrow what SoCal ADA is doing to ensure the most progressive candidate wins this key race (and other less glamorous contests) in this week’s Wednesday Campaign Wrap-Up. ADA's Delaware chapter is leading a call to support redistricting reform in Delaware. With 24 legislators co-sponsoring Delaware Senate Bill 48, community advocates are hopeful that this will be the year the Delaware legislature will vote to bring the redistricting process out from behind closed doors. In preparation for Wednesday's vote, ADA Delaware and its coalition members are holding a press conference today at the steps of the Delaware Legislative Hall. ADA now offers the first and only UCLA student group (out of 1,000) with the word "Progressive" in it. Welcome Progressive Leaders for Democratic Action at UCLA! Students, educators and parents may get some relief from excessive (and ineffective) school testing. Read more in Bob Lucore’s latest blog: Proposal Would Provide Relief from Excessive School Testing. FW: Did you see this? Join me in June! Sponsored: Rand Paul - Your thoughts?